The historic Notre Dame Cathedral in Paris, France is on fire. 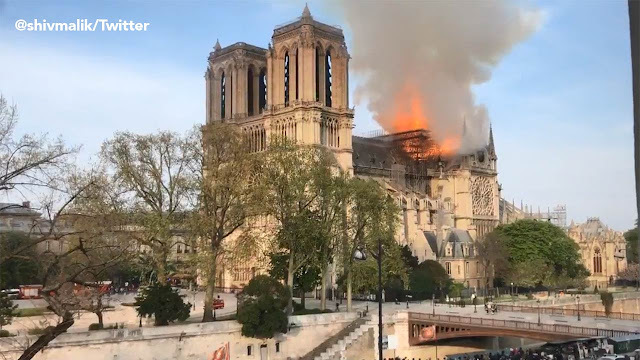 A fire broke out at Notre Dame Cathedral in central Paris on Monday, April 15, 2019 in the afternoon, a spokesman from the fire department said. UPDATES: The 300 foot spire has collapsed as the fire continues to cause extensive damage. The Cathedral gets over 13 million visitors every year. The police report that there were no people killed during the fire. The cathedral is almost 1,000 years old. The construction began in the 12th century, and it took about 300 years to finish. It is predominantly French Gothic, there are areas that demonstrate the Renaissance and Naturalism. A major operation is underway by the fire department, while a city hall spokesman said on Twitter that the area was being cleared.